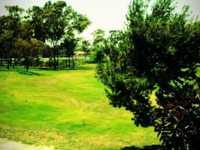 For anyone looking for cheap golf in Long Beach, Bixby Village Golf Course tee times are a great way to experience a fun, nicely maintained, 9 hole, executive course just minutes from downtown Long Beach. The Course plays 1,795 yards from the back tees, is a par 30, and for an 18 hole round plays to a slope of 87. It was designed by course architect Ron Fream, and opened in 1980. The course has two lakes, which both come into play within the first three holes. Large, mature, trees line the fairways, and strategically placed bunkers, including one placed right in the middle of the green on the 106 yard, par 3, 6th hole, make the course fun, and makes even experienced players think through their shots while managing the course. The longest hole on the course is the 350 yard, par 4, 8th hole, which is a big dogleg right, and a good tee shot requires staying out of the big trees all along the right side of the fairway. The Pro Shop has a full line of golf accessories, including golf balls, bags, hats, gloves, golf lessons, and much more. Riding carts, and pull carts are available for rental so you do not have to walk if you do not want to. Past players who have enjoyed their Long Beach tee times at Bixby Village Golf Course have commented on how it was a fun experience, how it was such a nice course, and a great value for their short game.